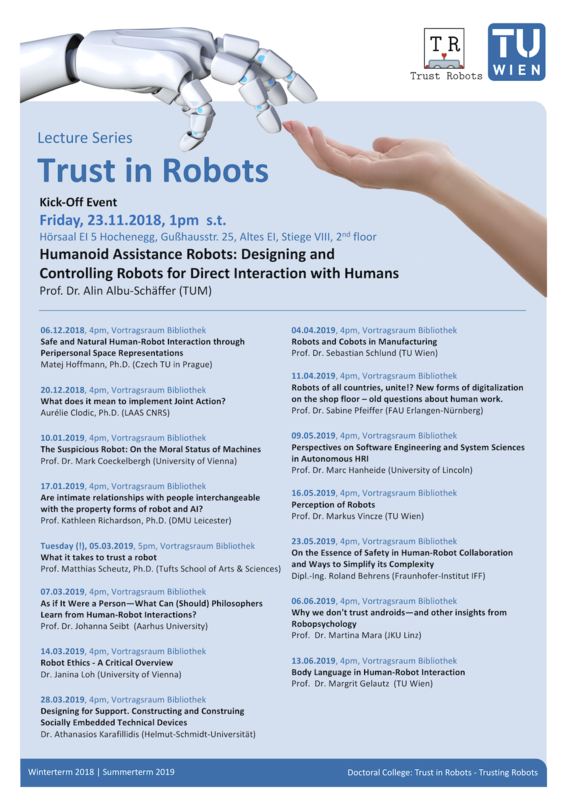 Join the interdisciplinary lecture series "Trust in Robots" and take part in an exciting journey to the robotic future. Lectures continue from 05 March 2019. The lectures are public and free of charge. TU Wien Bibliothek is a partner in the related doctoral college "Trust Robots". You have your draft paper ready and the only thing that is missing is a language polish, content edit or translations? Research and teaching staff at TU Wien now have access to editing services (English, German, further languages) at reduced rates. The external providers – their services are accessible through framework contracts of TU Wien Bibliothek – are specialized on manuscript services for academic and scientific writing. More time for your studies: From Monday, February 26, 2018, the main library's study and open access areas will be open for all users from 8:00am onwards. During term time, the extended opening hours will allow you to access the library from Monday to Friday from 8:00am to 22:00pm. As customary, our staff at the circulation desk (loans and returns, ground floor) and from information services (1st floor) are available from 9:00am to 19:00pm. By continuously aiming to extend its opening hours, the library is reacting to an important need of TU Wien’s students – to have access to reading and studying places as long as possible. From February 01, 2018, the library is applying new charges for the late return of borrowed items as specified in the new Scale of Fees document. The new fines are: € 4.00 per overdue reminder per overdue item. Reminders are sent when items are overdue by 14 days, 28 days and 32 days. To avoid fines, please take care to return your borrowed books or other items in time, or renew the loan on the online catalogue or by telephone (+43-1-58801-44061). We should like to remind our patrons that access to and use of the Library's subscription-based electronic resources (databases, electronic journals, and other electronic material) are subject to contractual agreements and licences with vendors, which impose restrictions on use. The Library's 700 study desks are in high demand. For this reason, it is not permitted to reserve seats and tables for unreasonable amounts of time. Unfortunately some of our users have been ignoring this rule. Therefore, the library has now introduced "parking meters" for the study areas. Library patrons leaving their desks set the time of leaving on the meter. The desk is reserved for the following 30 minutes. After that (or if there is no parking meter on a desk) patrons looking for a free desk may put aside any books or papers left on the desk and use it. If there is no parking meter on your desk, you can get one at the information desk or the circulation desk. The complete Birkhauser "Basics" textbook series, at present comprising 32 titles, are now available online on the TU campus. About Birkhauser "Basics Online": "Basics Online" are German-language textbooks covering the most important areas of architectural studies, such as design, architectural rendering, construction, building services, professional practice, landscape architecture and urban design. 50 additional titles and 2 new subject areas (building materials, building history) are to follow. Since mid-2015 the university library offers an institutional repository called reposiTUm to archive open access publications. Already more then 900 documents were made freely available worldwide.